“The End of Human Life,” which considers organ transplantation, suicide, decisions about prolonging life, and the determination of death. 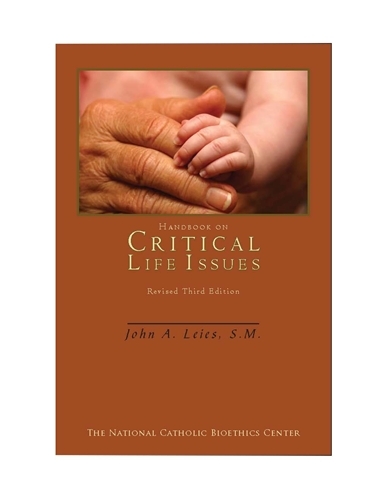 The appendices include a new chapter on eugenics, discussions of difficult end-of-life cases, the Declaration on Euthanasia, and the two Vatican instructions Donum vitae (1987) and Dignitas personae (2008). Each chapter has newly revised review questions that reiterate key points from the text and a set of discussion questions for generating student participation in classroom settings. This volume has been in continuous print for nearly thirty years. Rev. John A. Leies is professor of theology and President Emeritus of St. Mary’s University in San Antonio, Texas, where he has been named as an Outstanding Faculty Member of the School of Arts and Social Sciences and the Graduate School. The text is written in an authoritative manner that is geared for the average student. Father Leies includes many interesting stories and analogies. This is a great textbook for the classroom setting. Each chapter includes review questions and discussion questions. Rev. John Leies is Professor of Philosophy at St. Mary’s University in San Antonio, Texas and a former president of that institution.